Starting with an "Afore-Foreword" Judy sets the tone for her autobiography "…this is a book of memories and recollections…over 60 years of living…we all remember things differently…sometimes we get it right and sometimes we get it wrong…but mostly the truth lies somewhere in the middle…full of bumblingsabout and forgoodnesssakes and nearmisses and strangealmosts…and if you think there are mistakes then there probably are". Written with the help of Dave Thompson, Judy takes us on a journey through her life, intertwining recent diary observations with her past. Along the way we learn about life in post war London, about slugs ("how do they get in?") and about music. It's that sense of understanding and honesty that shines like a beacon through this book whether discussing her early music tastes (Cliff Richard, Adam Faith and Billy Fury - at the turn of 1960) or her vociferous reading appetite which explained her wish to be a Librarian. And if that implies a shy demure girl then the contrast of slipping out late in the evening to all the growing new late night coffee bar scene by tube with her girlfriends buries the image perfectly. We read about her first Autoharp, we listen as she explains the coming of Fairport Convention, the group dynamic, the relationship with Richard Thompson, the arrival of Iain Matthews, the music. It's warm but not ladled with syrup, no kiss and tell and all the better for it. The closest we come to bile is to record a comment made by Joe Boyd about Matthews and whilst acknowledging Boyd's contribution to folk music in general and Fairport in particular I doubt the phrase "nice man" is unlikely to be applied to him with much frequency. And aware as as I that for most folk that will be the starting point and the most eagerly read section I won't spoil anything by adding further detail. We smile as we learn the tortious steps needed to hang the washing out, living by herself in the countryside, we learn of her love for rescue greyhounds, we hear Judy being nagged by a blackbird for breakfast. All these things flow, chalk and cheese melding and folding, insinuating themselves into our consciousness. We move to post Fairport, to Giles, Giles & Fripp, to Trader Horne a duo with Jackie McAuley (the name of the band coming from the late John Peel). Her marriage to Simon Stable, his humongous Icelandic Sheepskin coat given to him by Alvin Lee of Ten Years After. We learn about her break from the music business and the tape copying service that paid the bills. The sad death, movingly related, of her husband. The rekindling of her music making with Marc Swordfish with the ambient led "Enchanted Garden", the rejoining of Fairport on stage despite her anxiety and nervousness. Cumulating in a one off reunion gig as Trader Horne performing the whole of their one album "Morning Way" at Bush Hall in 2015, a packed to the rafters event I was lucky enough to attend. This is a book that enthrals and entertains, no hairs and graces, no egos just a wonderfully warm ramble through the life of an exceptional lady. Full of little insights and truths or half truths if you prefer. One favourite for me that resonates strongly is "Whenever I read an interview with a songwriter whose work I love they say 'Well this song's about…' my response almost every time is that's maybe what's it about for you but for me it's something else". And I agree entirely it's all about what songs meant to those who listen, our interpretation. My interpretation of Judy Dyble book is personal, even though I fell in love with her quintessential English pure voice after discovering Fairport through an obsession with the music of Iain Matthews. It's an interest that continued with Trader Horne, through to the excellent "Talking With Strangers", to the quickly sold out triple cd "Anthology". I'm conscious my interpretation isn't doing justice as it should, it's a brilliantly warm engaging read but after all it's not my views that count. It's yours. Please read if you will and form you opinion that's what counts. Oh I nearly forgot and yes she does explain the knitting at the side of the stage in early Fairport days when Thompson or indeed Jimi Hendrix held the spotlights with their extended soloing ?? Dame Judy has obviously been asked many questions about her time as the first lady of Fairport Convention, or at least has been asked the same few questions many times, and she gets on with answering them early doors. Almost the first page in the book deals with the issue that any reminiscence of those times from this distance is likely to throw up mildly conflicting memories, which very sweetly punctures the self-importance of anyone ready to correct her on the exact date that she may have been at The Roundhouse to see Pink Floyd, and some of the more self-aggrandizing recollections regarding her departure from the Fairports which might appear in other memoirs of the era *cough – White Bicycles*. Tellingly, each chapter begins with a diary entry – not necessarily one from the era in question, but the inference is that this stuff was being written up as it happened. Before addressing the Jimi Hendrix story, confirming singing on The Incredible String Band’s album, meeting Sandy Denny for tea, and having to flounce into a room upon her being asked to vacate the lead singer’s position, she writes (or is at least transcribed) warmly and engagingly about coming of age in the Sixties, in much the same way that Viv Albertine did about going through a similar process a decade later, pointing out that no-one really saw the time as one of change and musical revolution until much later on. Refreshingly, she reflects on the era with a commendably down to earth eye for the minutae of the times. There’s also a lot of fag smoking. To be honest I’m only half way through so far – at this point she’s made an album, dated Richard Thompson, been fired from Fairport Convention, doodled some ideas with Robert Fripp and split up with the bass player who would later form Foreigner. She’s nineteen. The autoharp that Judy played on the first Fairport album was not destroyed as she thought, and is currently in the possession of Simon Nicol. Completing her comeback into collective conscious, former “lost lady of folk” finds the courage to go down memory lane and make it a highway to the future. 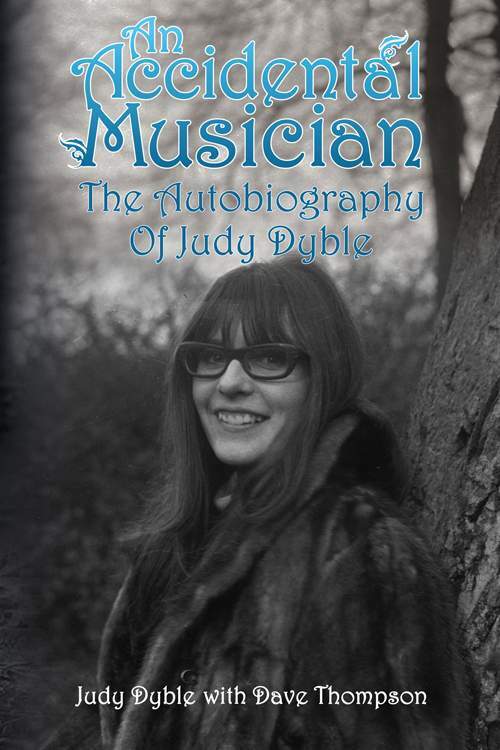 A footnote in the history of British popular music: that’s what Judy Dyble was for nigh on four decades – yet for all the singer’s shyness and refusal to accept her own importance, this story of the artist’s route is a fascinating tale. It’s riveting, and logical, too, even though there’s a great irony in the autobiography’s title indicating Judy’s unwillingness to see that she was bound to become what she is, and “accidental” can’t be the word to describe’s Dyble’s path, but that’s how she perceives her part in forming the identities of FAIRPORT CONVENTION and KING CRIMSON alongside smaller, if still integral to the big picture, achievements. “A story of me and my autoharp” is Judy’s method of describing her memoir and suggesting the instrument has been part of her own musical identity, although Dyble doesn’t hide behind it anymore when she weaves a yarn of life smoothly sliding into music, out of it and back again, and exposes her wonderment at all those events. With nothing coquettish in Judy’s denial of being a star – the songstress knew she was “never going to become the new Annie Haslam or Sonja Kristina” whom she’d preceded as a frontwoman – this tome is as charming and modest as Dyble herself is, her precious little observations, from snapshots of the post-war London and its ’60s city scene to pictures of a village existence with its pantomime plays, fleshing out the main course, her music. The first word of this book is “Listen…”; and that’s what Judy’s readers have been, and will be, doing for years, but here the artist allows the listeners a peek into some of her creations’ origins without demystifying them. Instead, a few other secrets are revealed, so we learn where Dyble’s only tattoo is and what Robert Fripp used to think of colored toilet paper. Jimi Hendrix, Rod Stewart and Cat Stevens make cameo on these pages, yet Judy offers no anecdotes about the legends beyond those encounters and wouldn’t pretend to know them closer than she did – they were accidental acquaintances, indeed; as for Judy’s apocryphal on-stage knitting, there’s much more – or much less – to it, all depending on how one could interpret such a way to retreat from spotlight and still remain there. Talking about her past and present with self-deprecating humor but at the same time with dignity – as befits a countess which Judy is by marriage, or an Englishwoman who mustn’t grumble – the only occasion where Dyble went as far as to admit the quality of what she did is in the chapter on TRADER HORNE: “we were good” may be the verdict which facilitated this band’s recent return, and with the same approach the singer’s mostly recent diary entries preface the tome’s parts to lead her to reminiscences of old, and not so old days. And that’s how, through Judy’s remembering that she wasn’t consulted on different decisions in various bands and recollections of her embarrassment at a Royal Albert Hall performance, she got her confidence, and music, back. Accidental, then? As accidental as a national treasure can be.